Much of what gets called Tabbouleh bears little resemblance to what Lebanese Tabbouleh is. 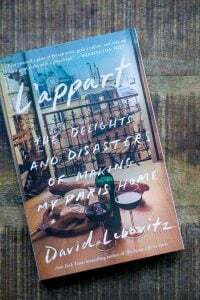 When I moved to France and began eating in traditional Lebanese restaurants, I was served bowls heaped with fresh herbs, a few tomato chunks, and very, very few bits of bulgur (cracked wheat.) Unlike what is served as Tabbouleh in many places – which is often a bowl heaped with bulgur with a few tomatoes and bits of parsley and mint flecks in it – the cracked wheat is meant to be more of a garnish, and I’ve come to love traditional Lebanese Tabbouleh, which is a green, herbal salad with a touch of spices. 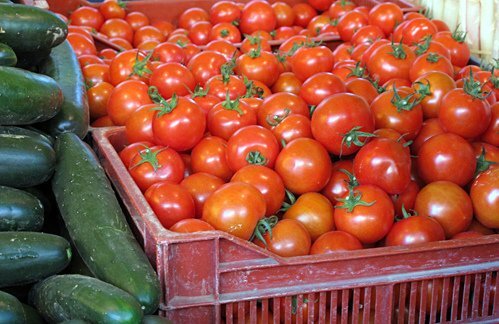 It’s not summer yet but I have just bought my first good tomatoes, a variety called Marmonde, large and ridged with a green tinge running through the top which faded within a couple of days. The texture of this variety is firm without being hard, and they don’t go mushy as they ripen making them ideal for Tabbouleh, where you need firm but ripe tomatoes. Tabbouleh has now gone truly global but before the world discovered and adopted it, it was one of very few dishes that the Lebanese could claim as their own – there has been a tussle for the last few years between Israel and Lebanon as to who owns tabbouleh! At first, the western version bore no resemblance to the Lebanese but things have improved and you can now find much better ready-prepared tabbouleh although often it will have far too much bulgur in relation to the fresh herbs and tomatoes which should be the main ingredients. Bulgur plays only a minor role to provide a little starch. And you ought to buy the best tomatoes you can find. As I said, firm but ripe. When I am not using Marmande or heirloom, I buy organic. Regular tomatoes are insipid and watery. The choice of bulgur (cracked wheat) is also important. It needs to be fine and preferably the dark Lebanese variety over the pale Turkish one. The latter goes rather mushy. Now for the preparation: forget about using a food processor despite the copious quantity of herbs. It is a definite no-no. Instead, make sure your knife is very sharp. 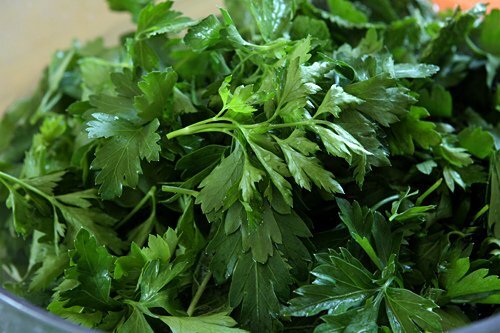 Then, gather as much herbs as you can handle under the palm of one hand (the parsley with a little stalk left and the mint, leaves only), holding them quite firmly but without crushing them and cut into the herbs as if you are shaving them into thin strips. You can chop the parsley ahead of time, even the day before, as long as you store it loosely in a hermetically sealed bag or container and keep it refrigerated whereas it is best to chop the mint soon before you are ready to mix and serve the salad. It tends to blacken quickly once it’s chopped. The spring onions need to be trimmed of any damaged outer layers and again ‘shaved’ into thin disks. As for the tomatoes, you can de seed them if you like. I don’t and I definitely do not peel them. The skin stops the cubes from going mushy. What is more important is to chop them ahead of time so that you can eventually drain the excess juice. This way you can keep the salad crisp. And the best way to dice the tomatoes into the required small cubes is to slice them thinly then put two or three slices on top of each other. Cut these into thin strips, then turn them and cut across into small cubes. If you are using fine bulgur, you won’t need to soak it. Simply rinse and drain it then let it fluff up for about half an hour, stirring it with a fork every now and then. The seasoning varies from family to family or region to region. I learned from my mother and grandmother to use a pinch of cinnamon, a good dose of allspice (or the Lebanese 7-spice mixture), and some black pepper. My mother uses too much lemon juice. I prefer less, mainly because I often serve tabbouleh with wine. And of course olive oil, the best you can afford. When I lived in Beirut, our supply came from my mother’s uncle who had olive groves in the Chouf mountains. He picked his own olives and never left the press while they were being pressed to make sure they didn’t mix his oil with an inferior one. Not to break with tradition, I get my oil in London from my friend Mary Taylor Simeti who grows her own olives in Sicily although I am not sure if she also watches her olives being pressed. I must ask her. And finally salt. I only use sea salt, and these days I have a new favorite, a pink flaky salt which I brought back from Australia. 1. Rinse the bulgur in several changes of cold water. Drain well and put in a bowl. Stir it with a fork every now and then to help it fluff up. 2. Put the diced tomatoes in a bowl and set aside while you prepare the herbs. A word of warning: do not chop the herbs with a mezzaluna. This will only bruise them. 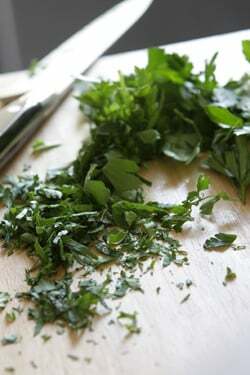 Using a razor-sharp knife, grab as much of the parsley and mint as you can handle in a bunch, and slice them very thin, to end up with nice, crisp slender strips. 3. Drain the tomatoes of their juice and put in a large bowl. Add the spring onion and herbs. Sprinkle the bulgur all over. Season with the cinnamon, allspice and pepper. Add salt to taste. Add the lemon juice and olive oil and mix well. Taste and adjust the seasonings if necessary. Serve immediately with the quartered gem lettuce. 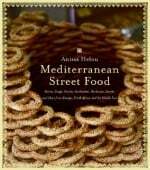 Anissa Helou is the author of several cookbooks, including Lebanese Cuisine, Mediterranean Street Food, and Savory Baking from the Mediterranean. She leads culinary tours and teaches cooking classes. You can follow her on Twitter. -This recipe makes quite a bit. And although it’s easy to eat it all, feel free to cut the recipe in half. 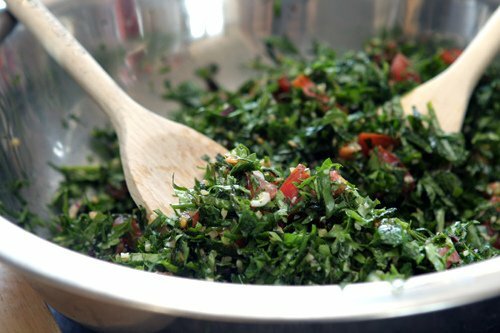 -Tabbouleh is best served the same day it is made. Anissa gives some do-ahead tips in the post, and although it changes a bit overnight, I dressed all the salad and happily enjoyed the rest the following day. 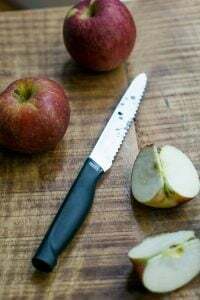 -The best way to chop the herbs is to gather them into a tight wad then using a chef’s knife to chiffonade them, cutting them in thin strips. -If you can only get medium bulgur, you can use it in place of the fine bulgur. I’ve made it with medium grains and it came out fine. If you’re concerned it won’t soften, let the cracked wheat sit in cold water a few minutes before draining. -Like others, I was surprised that Tabbouleh had spices in it. But in fact the word “Tabbouleh” is a derivation of the word Tābil, which means “to season” or spiced, and is also the name of a Tunisian spice mix. -If you wish to track down Lebanese seven-spice powder, it’s available on Amazon, at Kalustyan’s, or can be found markets that specialize in Middle Eastern ingredients. -Cracked wheat, or bulgur, is available in natural food stores and ethnic markets, Many well-stocked grocery stores carry it as well. 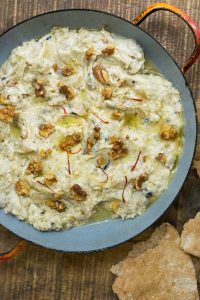 -Because this recipe relies on a small amount of cracked wheat, you can make a gluten-free version by substituting a few spoonfuls of cooked quinoa or millet. 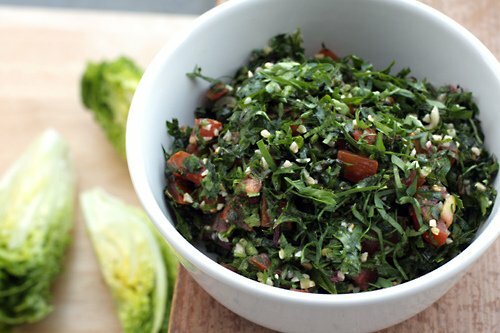 -There are several spellings of Tabbouleh (tabbuleh, tabouleh) and bulgur (burghul, boulghur, bulghur) are amongst them. There might be regional variations, with some places using more bulgur than others. I think of hummus where the proportion of the ingredients vary country to country. 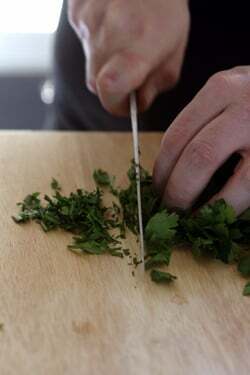 Kulsum: I have a very sharp knife and it really takes less time (I think) to just chiffonade the herbs. It’s completely worth it and I will never make Tabbouleh the “old way” again! the point about the chiffonade is that it keeps the salad crisp and makes it last longer after it is dressed. Harold McGee has a v interesting chapter or passage on why salad goes soggy and it’s because of the way the leaves or herbs are cut (or chopped). the more cuts, the more opportunities for the dressing to be absorbed into the leaves or herbs and the more chance for them to go limp. of course, these are my words. he explains it much more elegantly and more to the point, accurately! funny, i had posted a comment as soon as i read the post but i may not have submitted it. perhaps it was too early in the morning :). in any case, thanks so much for hosting me david. love the pics and love the lay-out. and i have to admit that your chopping is even better than mine. as good as my mom’s. you and her are masters at chiffonade! and am so happy to read you will never make it the “old way” again. 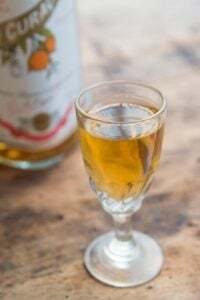 it really is a great way, and a shot of good health every time you take a mouthful! That’s what I call a Tabbouleh! I only love it that way, I usually serve it with Greek yoghurt, a few big green salad leaves, and olive oil. I love tabbouleh and however much parsley and mint I put in, it is never enough and seems to get swallowed up by the other ingredients (I usually make it from my own guesstimation). I’m excited to have a recipe which will help me get the amounts correct! It looks great and is very welcome as this is one of my summer staples. David, I’m so glad you included this recipe on your site. While in Paris this Spring, I enjoyed Lebanese for the first time (and second, and third . . .) and I’m just tickled that I can make the tabbouleh at home. I haven’t been able to find an authentic recipe yet, and this looks like exactly what I enjoyed on the Rue de Montorgueil. Thank you, thank you! Dear David, I live in Turkey. The one that is made here is the one you mentioned, with lots of bulgur, little greens, but the name is entirely different: KISIR is the name we call it. I guess , it is the Turkish version. Thank you. Does anyone know how to make Fasolia (not sure if I spelled this correctly)? A dish from the same area…spicy bean dish. Thank you. This may be a silly question, but would the dish would be greatly diminished without the mint? 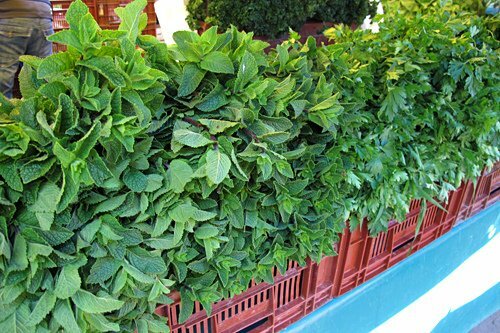 I have an allergy to mint which always prevents me from trying it at restaurants. Just curious if a non-mint, home-made attempt would still be delicious. We had the same burghul culture shock when living in Australia several years ago – great Lebanese restaurants everywhere – often with take-away, so ideal for young families. And in every place was our staple salad, tabouleh; but instead of white with green flecks it was green with white flecks! And much better that way! 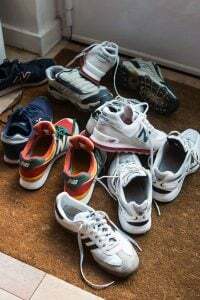 This is a great post and the pictures brought back all those memories. Thanks. James: I thought cutting all that parsley would take a while, but it went fairly quickly. (And it doesn’t need to be done perfectly, as Anissa mentioned in her comment.) But I feel the same way that you do and am happy to know how to make that traditional Lebanese Tabbouleh that I love so much…at home! How perfect-I am visiting with my Chefs Move to Schools kids tomorrow and they grew herbs for their project with me. Thanks for the inspiration! Elyse, I’m Lebanese Armenian and our variation is no mint, add cucumber, and for the spices, use only sumac and aleppo pepper–trust me, it’s still amazing. If you’re like my grandmother (who loves spicy), throw in a jalapeno (seeded, of course). 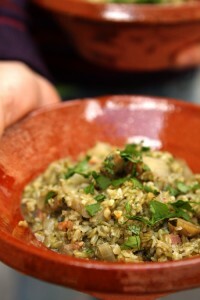 And yes, the parsley to bulgur ratio is still heavily in the parsley’s favor. Nancy: fasoulia couldn’t be easier! This is my mother’s quick version: get some cubed beef, season it with salt, pepper and red pepper. Brown it in some hot vegetable oil. On top of that, drop in a bunch of green beans (frozen is just fine if you want to skip the prep). Cover the pot and let the green beans steam a bit (especially if they’re frozen). 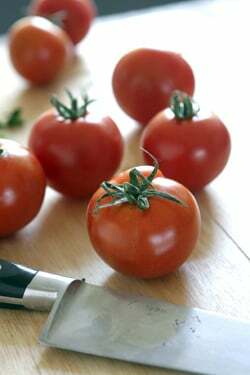 Blend 3 – 5 tomatoes into a puree with a clove or two of garlic. Pour the tomato mixture on top of the green beans, give it all a stir and let it cook over medium-low heat until the meat is done and the green beans are tender (probably half an hour). I know I haven’t given you any amounts, cause everything is to taste, but definitely more green beans than anything else. Anissa, I love your recipes. 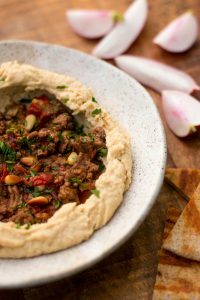 I have your Lebanese Cuisine cookbook and the recipes are very similar to my family’s own recipes. thanks for the recipe. Must give this a try. And I love the salt you mention, it’s my all-time favorite. Anissa and David, thank you so much for this post. I am really looking forward to trying this with my tomatoes and parsley from my garden this summer! The versions of tabbouleh that I’m used to eating are good, but nothing like this. They are usually made with couscous and have lots of vegetables and chickpeas! Your authentic version looks amazing! I’m surprised this recipe doesn’t include garlic. I thought that was always one of the ingredients but maybe I have been making it all wrong. I usually omit green onions when making tabbouleh and I’ve never tried mint. I like sumac in it too but I’ll try the other spices for a change. One thing I like doing however, is slicing a fresh baguette with soft butter and adding tabbouleh on top. It makes for a really nice canapé and it’s so refreshing. In regards to olive oil, there are so many good ones out there, but one that’s easy to find is the organic one from Acropolis; you can literally eat it with a spoon, it’s so good, and for recipes like these it makes a world of difference. Your photos are just fabulous in this post! I have a friend from Iran who made taboulli for me many years ago and that’s when I realized how little our U.S. version compares to the more authentic tabbouli as it’s eaten in the middle east. And I love the idea that this is loaded with mint, which I love the flavor of! 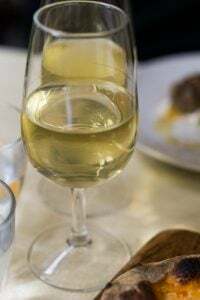 Where in London can I buy Mary Taylor Simeti’s olive oil? This looks amazingly fresh. I’ll have to keep a look out for good parsley and mint at the farmers’ market. I’m not confident that I’ll be able to find gem lettuce, though. What would be the best substitute? Anyhow thanks for this!! I couldn’t even remember the name & now I have it and the recipe! I make tabbouleh all the time in the summer. I love tabbouleh!!! My favorite summer salad and maybe all time fav salad. Thanks for sending the FULL post in the email too.. I like to add a bit of dill to mine and up the lemon with less oil. I’ll make this today too. I also love tabbouleh and can’t wait to try this recipe. I’ve got the mint growing in my garden, just have to be patient and wait for beautiful tomatoes. The scallions are a nice touch, I usually use onions but they can be a little overpowering. ready to try them all! Thanks, so very much. Hi David, I’m so glad you specified to your readers that the cracked wheat should not be predominant in a good tabbouleh. So many times , I’ve seen more beige(cracked wheat) than green.Your pictures are beautiful as ever, and they make everything so tempting. I must say, however that neither I nor my mother ever used allspice and I’m not sure I’ve seen a recipe that called for it.I just may try it.I love garlic and a lot of lemon (cause I’m a lemon freak).Thanks for the article. P.S. I wish someday you would write about your time spent in Beirut. That must have been quite the adventure. one of my favorite dishes growing up – my mother had an Armenian cookbook that had a great tabbouleh recipe in it. A great tip that the cookbook suggested for a more flavorful couscous is to soak the bulger in the chopped tomatoes and allow them to soak up most of the tomato juices. Ah! This is one of the best tabbouleh recipes I’ve seen! Just the mint itself has me excited. It’s a must-try. eddie, mary doesn’t sell her oil commercially in london. i get a few cans for me and my friends and i sell it at the same price that i pay mary. this year’s lot is all gone but i can count you in for next year’s. just let me know. One of my favourite summer dishes, it’s probably not authentic but I like to add a little fresh coriander (cilantro) & a finely chopped green chilli, & I tend to use lime juice rather than lemon. I must confess I don’t chiffonade, largely because making tabbouleh is pretty much the only time I ever get to use my mezzaluna, and I really enjoy its rare outings. I love serving this to guests with a piece of simply grilled fish and watching the expression on their face as they take their first taste and get that feeling that the entire cast of Riverdance is tripping the light fantastic across their palate. I had no idea that the true tabbouleh included majority herb, minority bulgar- oh how we are misled here in the U.S. on foreign foods. Thanks for sharing! This inspires me to go water my parsely and mint plants. 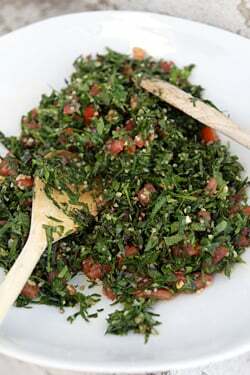 Tabbouleh is one of my favorite salalds, it just explodes in your mouth. 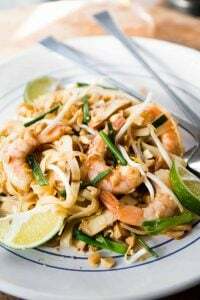 I have eaten it in restaurants across the country, a very stable recipe with slight variations- many don’t add the cinnamon and allspice here, some add pieces of lemon peel (love it), with or without garlic and mint but never with coriander. I bought myself a great big mezzaluna just to make it at home. the traditional American version. But this “authentic” version sounds fabulous! Why am I always so shocked to find out about another Americanization of a dish that pales in comparison to the original…. Anissa, thanks so much for the response about the mint. I’ll have to try this once tomatoes start looking better here. I always did crave for my tabbouleh to have more fresh veggies then bulgar, but I never knew that the authentic version was exactly what I was looking for! I really do need to travel more. Oops!! On rereading the post , I just realized that it was Anissa who spent time in Beirut and not you, David. Sorry, my bad.Next time I promise I’ll pay attention. Still it would have been interesting to read about your impression and description of the place, since I’ve wanted to visit there for as long as I can remember. Love this dish! Yes, we (Turkish people) do use bulgur and make KISIR in Turkey which has lesser amounts of mint and parsley but I have to say I love both versions, I think it is very refreshing! Thanks David for sharing it! Merci for correcting her spelling of Marmande… I lived there for four years and those tomatoes (well, and the other 50 varieties available at their amazing tomato festival and in season!) deserve the proper nomenclature! Her recipe sounds fabulous; can’t wait to try! Thanks, Anissa and David, for a great post! I will definitely make this soon! David, this looks great. I’ll make it and take it to a potluck birthday dinner at the Grange Hall next week….I know everyone will like it! I have tried numerous recipes of Tabouleh, and this one truly brings the flavors I was searching in a close to perfect Tabouleh. Perfect for a summery salad. I’ve been doing it wrong it seems–lots of the cracked wheat & skimpy on the veggies. But I can change & in fact am looking forward to it because I love lots of fresh parsley in salads. BTW, somebody made your shortbread with tomato jam that I posted & just raved about the recipe:-) And rightly so! This recipe made me realize what I had been doing wrong all this time and now it makes perfect sense: spices. I used buckwheat instead of bulgur to keep it gluten free and it worked perfectly. I remember the first time I had this dish and I was so puzzled that they called it tabbouleh being used to the other kind with bulgar being the main ingredient. It didn’t matter what it was called once I tasted it-so good and fresh. We were eating a take out meal from a Lebanese place and there were servings of 7 cold dishes and then 7 hot dishes. Amazing. I make tabbouleh almost every weekend, although it’s very different from this one and with bit more bulgur. This weekend will surely give this one a try. I use cucumbers for the crunch and also add lightly sautéed baby spinach in olive oil and garlic. One learns something new and different every time. Thank you, David, Anissa and everyone. It is such a pleasure to read your blog and the exchanges – surely jumpstarts my mornings. No more long, hot, dry summers – with this tabbouleh! Many thanks, anissa. I’ll drop you a line through your website. I love Tabbouleh….and have received the recipe from my Lebanese friend’s mother who was visiting one summer in Baltimore.. I actually helped her make it and with it I actually had a private cooking class. It is very similar to the one you posted…a really delicious meal…. Some years ago…….there was a huge Lebanese party going on in Baltimore and I had a cooking class scheduled with the Tabbouleh recipe….The day before the class I did my grocery shopping and of course needed lot’s of parsley….I could not find a single bunch in any of the 5 grocery stores that are in our area….every Lebanese household was making Tabbouleh for the big gathering ……..I did have the mint in my garden…. I just found your site and can’t wait to try some of your recipes. The chocolate dulce de leche flan looks like a good one to start with. My sweet tooth always gets me. Can not wait for the Early Girls to get here! They will be what I use for this…mmmmm! <3 anissa! we miss you around here! I’ve been appreciating the vegetarian food and I tasted the other tabbouleh. I realy thought that there was just only one type of tabbouleh too. I’m brazilian and I like so much the Arabic food. Fasoulia, can be made with different kinds of beans (kidney beans or other smaller ones white or brown). The trick is to use both dried and green coriander when you saute the garlic before adding the beans themselves. and towards the end you add a squeeze of lemon or even better pomegranate molasses. I love tabbouleh with a fair amount of bulgur–I have a squirrel’s love for grains, nuts, and seeds–but I always put in more herbs and veggies than bulgur. It’s hearty and crunchy and a summer staple at my house. Love the real tabbouleh. We first found it at the little Ali Baba cafe in Ivor Place, London, which does the most delicious tabbouleh and the best grilled chicken you’ve ever tasted. Close to Baker St tube and Marylebone Station. Made it. Yum! Thanks for the inspiration. Thanks for the inspiration. Had all the ingredients on hand, mint, parsley and the lemon from outside on my deck and the other ingredients in my pantry. Interesting. Tabbouleh must be one of those foods (like hummus and falafel) that has migrated all over the Middle East and been adapted wherever it landed. I’ve lived in two cities in the US with large Arab populations, but in restaurants and Middle Eastern grocery stores I’ve never seen or tasted tabbouleh with mint in it. Both of those Arab-American populations are mostly from Syria. Perhaps it’s different there? Mind you, mint in tabbouleh sounds good. But the proportions of greens to bulghur wheat in what I buy is pretty much as David and Anissa describe it. I love mint, I will definately use this and point my friends in the direction of this blog. mmmmmmmmmmmmmmmmm. so interesting to know that the bulgar is often overdone in western tabbouleh! the herbs and tomatoes together sound so much lighter and fresher. This sounds delicious, and a lot like the tabbouleh at my favorite restaurant here in LA. David, next time you come to LA, you have to make a trip to Marouch! I just made this recipe last night. I halved the recipe and used less parsley and about 1/3 more bulgur than called for. Three of us loved it and won’t go back to my old, much more bulgur way of making tabbouleh. Will have leftovers for lunch today – David’s right that leftovers have a different consistency, but still good. (This is not a do-ahead for company, as it doesn’t look as pretty once dressing sits on salad for a while.) The chiffonade-style may not be traditional, but it is easy (if you use the right knife), beautiful and well suited to the recipe. I’ve just linked up to it on over on my place. I suffered years while living in France seeing the French sell a concoction with couscous and a few spare bits of parsley as “tabboulé”. My! 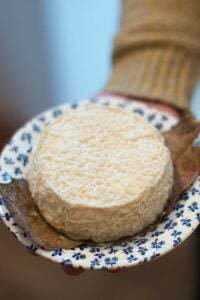 I am so glad these days are over and people now are informed about what an authentic tabboulé should look and taste like! I might add that the variety of parsley makes a huge difference; the parsley in Lebanon is extremely tender and the Italian parsley that one finds in the US does not even remotely resemble this parsley. Oh well, a la guerre comme a la guerre, one must do with what one finds! Tried this last night – loved it with the spices – and I’m very pleased to have this recipe in my collection. Thank you for sharing. For some reason, the tabbouleh available in my area, whether in restaurants or pre-made at the grocery store, is insipid, inedible. I expected to like it more than I did, and now I know why: I’ve never had real tabbouleh until now. Very interesting recipe and comments. I am only familiar with the bulghur-heavy tabbouleh. I find that quite tasty, but this recipe sounds better. Cant wait to try this recipe as my herb garden is currently overflowing with mint and flat leaf parsley! I like to make my tabbouleh with Quinoa, because it’s a complete protein. Tabbouleh story: My boyfriend invited me to his family’s house for passover dinner in order to meet his parents. I’m not jewish and know nothing about Jewish traditions and I was afraid he didn’t tell his parents I am vegetarian. I ended up making tabbouleh in order to both impress his parents and make sure there was something at dinner I could eat!